KLR Hammers are manufactured to international specifications, from only the best quality Alloy Steel, machined to high precision and supreme standards. 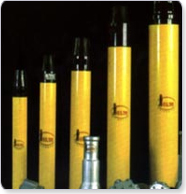 The products are heat-treated in the most modern, fully process controlled, in-house facility. The Carbide Buttons which are used are obtained from leading and reputed indigenous and foreign manufacturers.